VISIT LONDON, THE GREATEST CITY IN THE WORLD. London in the 1920s is the greatest city in the world, a vibrant melting pot of history and culture at the heart of the British Empire. 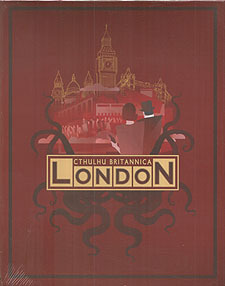 This boxed set is the ultimate Call of Cthulhu guide to running games set in London, including information on everything from the public transport network and currency to the bustling party scene and the long arm of the law. Beneath the glitz and glamour of Mayfair and the Ritz lies a seedier underbelly, for London sits atop its own history. Who knows what secrets lie buried? As well as guide to the city itself, this box set also provides Keepers with all the resources they need to run Call of Cthulhu scenarios in London. From Mythos threats and a ready-made private club devoted to investigating the weird and wonderful, to three complete scenarios, there's no shortage of ideas and advice.